It's been nearly a week since the Republican plan to dramatically alter the Affordable Care Act died without a vote in the House of Representatives. It's 84 weeks until the next national election, the 2018 midterm. But at the very least, Republicans have some explaining to do to their base. Nearly every Republican candidate running for federal office over the last four cycles (2010-2016), Trump included, has emphasized at length the need to “repeal and replace” the ACA (“Obamacare”). The party won three of those four elections, taking the House from the Democrats in 2010, the Senate in 2014, and finally the White House in 2016. Given the power to actually do something about the ACA, Republicans couldn't even get their repeal/replace bill through the House, where they could have afforded more than 20 GOP defections even without a single Democratic vote. Philip Klein, managing editor of the Washington Examiner and a conservative health care expert, wrote a piece 3 in the aftermath of the House's failure to act headlined “GOP cave on Obamacare repeal is the biggest broken promise in political history.” Without necessarily signing on to Klein's ambitious but defensible assertion, we can say that the GOP certainly talked a big game on dumping the ACA and then, at least for now 4, didn't deliver when they hypothetically had the ability to do so. While there may be political benefits to inaction, namely ducking blame for the potential loss of coverage that millions of people could have suffered as a result of the GOP's alternative, failure on a major legislative priority isn't a good look. The GOP had so many years to produce an Obamacare replacement and ended up with a bill that satisfied hardly anyone (certainly not anyone on the left, and not that many on the right, either). No wonder it fizzled. Midterm elections, where national turnout is typically around 40% as opposed to a presidential election's 60%, are often about enthusiasm. The party out of power is frequently more fired up to turn out, and Republicans have to be worried that by failing to roll back the ACA after promising, ad nauseam, to do so, their own base might be less inclined to show up next year. Again, that's a long way off, and some new issue could be animating voters in the fall of 2018. President Donald Trump never seemed to fully embrace the AHCA, but he did try to sell it, mostly unsuccessfully, to wary Republican House members. He and his administration made little effort to enlist Democrats or the general public in the effort, though. In fact, Trump seems eager for an alternative solution. He hopes the ACA will wither so he can pin its failure on the Democrats, who passed it during the Obama years but, at least partially as a result of Obamacare, currently control none of the levers of power in Washington. “The Democrats will make a deal with me on healthcare as soon as ObamaCare folds - not long. Do not worry, we are in very good shape!” Trump tweeted Monday 5. But if history is any guide, Democrats will believe they have zero incentive to deal with Trump on much of anything. And that's not just because their own base extremely dislikes the president and is urging maximal defiance of his proposals. As the University of Maryland's Frances Lee ably argues in her recent book 6, Insecure Majorities: Congress and the Perpetual Campaign, both parties have been moving away from bipartisanship for decades. That's particularly true when they are in the minority in both chambers and do not hold the White House, which is where the Democrats are now. Prior to 1980, Democrats had held both the House and the Senate for almost the entirety of the previous five decades. As Lee notes, Republicans didn't really believe they could win the House or the Senate for much of that time, nor did Democrats truly believe they could lose them. Republicans, therefore, tried to work within the system to influence the majority party's policies instead of truly trying to take control. That changed in 1980, when Ronald Reagan won the White House and Republicans surprisingly won the Senate for the first time since a brief, two-year period of narrow control from 1953-1955. That gave House Republicans hope they could eventually win the House, and it presented Senate Democrats with the challenge of trying to win back control of the Upper Chamber. Indeed, 1980 ushered in a new era of two-party congressional competition, and House and (especially) Senate control have flipped several times apiece since then. Throughout the 1980s, both minority caucuses came to the conclusion that heightening the contrast with the majority caucus was a better path to winning a majority than working with the majority. This means prioritizing politics over policy. That effect is amplified when one party is in a minority in both houses and does not hold the White House, because that party can credibly claim it bears no responsibility for anything that happens in Washington. This dynamic helps explain why Republicans didn't support Democratic efforts to change health care in the first two years of Bill Clinton's presidency (an attempt that failed) or the Affordable Care Act in 2009-2010 (it eventually passed without any Republican support). It also explains why Democrats made no attempt to cooperate with Republicans in their attempt to change Social Security in 2005 or to change Obamacare through the American Health Care Act last week. Not only were these bills anathema to the minority party, but the minority party also reasoned that there was more political upside to unconditionally opposing those bills instead of trying to influence them. That means they either block the legislation if possible or, if it passes, they can say that they did not support it if problems emerge. Democrats have now come to the conclusion that obstruction is preferable to cooperation, a finding reached by other minority parties for the past few decades. That Republicans are hardly making any effort to find common ground with Democrats only makes their decision easier, but even if Republicans were moving to the middle in an effort to attract Democratic support, the Democrats still would likely see no benefit in cooperating. Trump can try to blame any problems with health care on the Democrats. Perhaps he would succeed, although Democrats can argue that they have no power in Washington and that Trump and the Republicans have not really sought their input (at least to this point, save for a couple of Trump tweets). And beyond the difficulty of Trump trying to convince the public he is a passenger when the public views any president as the driver, this seems like a hard sell for a chief executive who does not have broad support. While specific polls vary greatly, and without forgetting the failure of many polls in 2016, Trump's approval rating is poor overall. According to three major approval averages (RealClearPolitics, HuffPost Pollster, and FiveThirtyEight), Trump's rating is barely over 40% and his disapproval is over 50%. Again, the midterm is a long way away, but those are the kinds of negative approval numbers we've seen from presidents who have suffered big midterm setbacks. 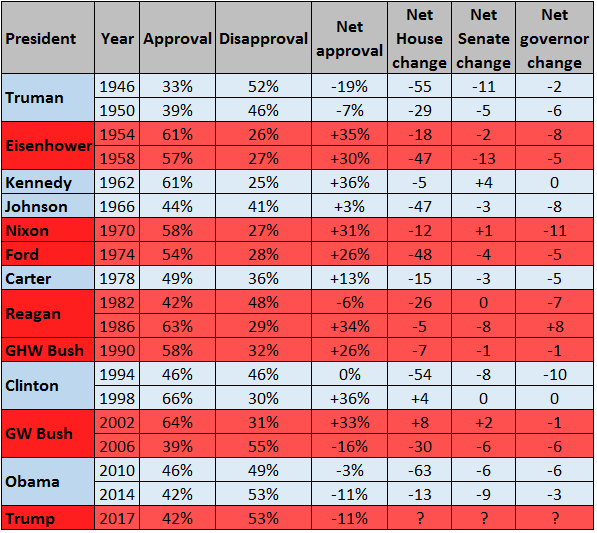 Table 1 shows the approval and disapproval ratings for all post-World War II presidents during their midterm elections, and the results of those elections. Note: Approval ratings are for presidents on the day of the midterm election or in the most recent poll or average available before the midterm except for Trump, where his approval average is as of Wednesday, March 29. Source: Gallup 8 for presidential approval from Truman through Clinton, RealClearPolitics average for Bush 9, Obama 10, and Trump 11. Net loss for the president's party in Congress and gubernatorial races is from The Surge 12. As you can see, the president's party typically loses ground in Congress and in statehouses during midterms, a consistent trend throughout American history. Even popular presidents aren't immune to these losses: Dwight Eisenhower, for instance, was well-liked for essentially his entire presidency, but Republicans lost ground in both of his midterms (including a huge defeat in 1958 thanks to a deep recession). But some popular presidents can mitigate or even avoid midterm losses: John F. Kennedy (1962), George H.W. Bush (1990), Bill Clinton (1998), and George W. Bush (2002) all saw limited losses or slight gains in some cycles. Unpopular presidents, or even those with middling approval ratings, uniformly see their parties do poorly in the midterm. Eight postwar midterms were contested under presidents with weak approval: That includes the six elections where the president was underwater (1946, 1950, 1982, 2006, 2010, and 2014) or was basically at equal approval and disapproval (1966 and 1994). In those elections, the president's party lost, on average, 40 House seats each election. Yes, this is a small sample size, and Republicans have a number of advantages in the House right now, including a stable of strong incumbents in their most vulnerable seats and favorable maps in many states (we explained these advantages in more depth in our initial House ratings 13 released a couple of weeks ago -- Democrats need to net 24 seats to win the House next year). A potentially scary thing for Republicans, though, is that even at a weak -11 net average approval, Trump's numbers may be artificially high. Despite the swirling crises of Trump's first couple of months -- the AHCA failure, the travel ban's legal travails, Trump's never-ending flow of factually dubious statements, questions about the Trump campaign's interaction with Russia, etc. -- the nation and world are fairly tranquil right now. There has not been a major terrorist attack in the United States so far this year, the stock market is strong, and baseline economic statistics like GDP growth and employment have been solid. Americans' consumer confidence, as measured by the University of Michigan 14, is near 100, or better than it was for almost all of Barack Obama's presidency. While still negative, right direction/wrong track polling has improved since Trump's election 15. What happens to Trump if/when there is a crisis that is not of his or his party's own making? What happens if there is an economic downturn? The United States has experienced 77 straight months of positive job growth, a record -- isn't it likely that a record-long streak will not continue in perpetuity? The flip side of that is if Trump and his administration do get their act together, Republicans might have some positive things to run on next year if conditions remain the same as they are now. Democrats don't want Trump and the Republicans to be able to push any sort of positive narrative, which gives them a heavy incentive to do whatever is in their limited power to keep Trump's approval rating where it is -- or even to push it down further. This means denying him any success on anything. So expect Democrats to try to hold together as an opposing bloc as Republicans consider tax reform or revisit health care. Democrats also will put the onus on Republicans to keep the government from shutting down at the end of April, and they appear poised to attempt to filibuster Neil Gorsuch, Trump's nominee for the Supreme Court, which could force Republicans to eliminate the filibuster for SCOTUS nominees 16. (Democrats did away with it for other kinds of presidential appointments in 2013, arguing that it was necessary because of GOP obstruction.) Democrats also don't have much incentive to provide votes for Trump proposals they may agree with, like a big infrastructure package, because they are likely to view interactions with Trump as a zero-sum game: If they help him do something that the public likes, then he gets politically stronger and they get weaker. Above all else, they will root for failure, both for Trump and for congressional Republicans. That's very much in keeping with how Republicans dealt with Obama, and, as Frances Lee illustrated, how both parties increasingly have coped with being out of power for the past several decades.